CrossFit is a training system involving functional movements which are varied constantly and all performed at a high intensity. The movements are our daily natural movements but done at high intensity series. CrossFit Inc. was founded in 2000 by Greg Glassman, and HIIT was based on a study by Dr.Izumi Tabata, involving the subjects performing 20 second exercises followed by 10 second rest period. The results showed a 14% increase of aerobic performance (stamina) and a 28% increase of the anaerobic performance (the ability to build muscles). HIIT (High intensity interval training) also includes constant variations of high intensity exercises performed in short bursts but followed by recovery periods of medium intensity exercises. Both CrossFit and HIIT can involve the use of Olympic weight as well as sprints, but can also include climbing ropes, throwing tires and other exercises. Both training programs encourage the participants to push each other forward and to train harder for better results. Both programs are believed to have originated from the Swedish “fartlek” speed training program established back in the 1930’s by Gosta Holmer. He created this training program for the cross-country team of Sweden, who had been constantly losing from their biggest competitors from Norway. Both programs are excellent ways to burn fat, build and sculpt the muscles and to improve the overall athletic performance in a short time. CrossFit is a branded franchise which has more than 1,700 CrossFit affiliate gyms across the US. It is better systemized than HIIT, and as a branded training program costs more than the HIIT training program. CrossFit has a more holistic approach to physical improvement by boosting the proficiency in: cardiovascular and respiratory endurance, increasing the stamina, power, speed, strength, coordination, flexibility, balance, agility, and accuracy. When this is done, it is believed that the metabolism is boosted which leads to neurological and hormonal adaptations which is what true CrossFit fitness is, according to its owner. CrossFit does include HIIT, but it also has some additional exercise programs, such as some gymnastics and Olympic weight lifting. HIIT typically offers separate training programs for those who want to lose weight or for those who want to build muscle mass (get lean vs get strong training programs) which is great, because everybody enters the gym with different goals. HIIT is based on challenging the body by challenging its heart rate. 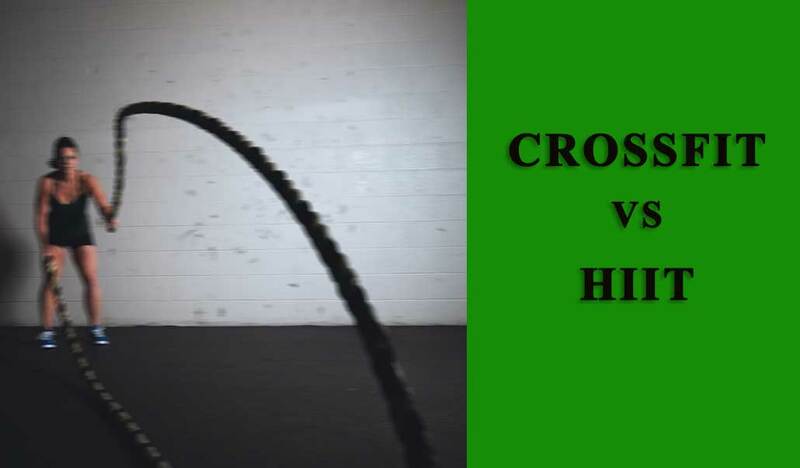 The high intensity workouts of both CrossFit and HIIT will help you burn fat because the intensive short bursts of exercises burn a lot of calories, so if you really push yourself at the training sessions of either of the two exercise programs, you should start noticing the first results in the first couple of weeks of training!